Acidity is a very common problem. Charak Alsarex reduces hypersecretion of acid and neutralizes the excessive acid. It is a natural product to get rid of your ulcers naturally and gives instant relief from ulcer pain. 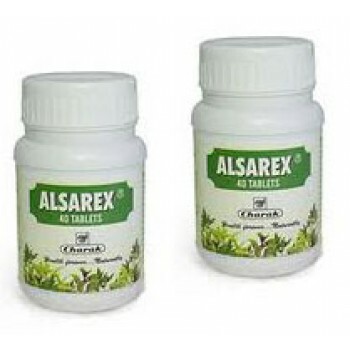 Using Alsarex regular can avoid surgery and gives permanent relief from acidity. 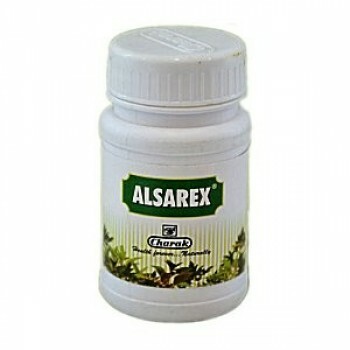 Alsarex is an ayurvedic formulation especially prepared for treatment of different digestive disorders. It is indicated not only in Acidity and gastric ulcers but in heartburn, dyspepsia and duodenal ulcer. It relieves nausea, vomiting and acid regurgitation. It is safe for long-term use and has no known drug interactions. As a co-prescription with NSAIDS to prevent mucosal erosion in the stomach and duodenum. Two tablets two to three times a day with a bland diet for three to six weeks. Ayurveda Rasashala - Laghusootshekhar 60 TabletsIndication:AnorexiaAcidity Acidity induced..